If gum disease, genetics, age, or other circumstances have robbed you of many of your teeth, you may be an ideal candidate for full dentures in Abington. This restorative treatment can quickly and comfortably replace an entire arch of missing teeth so you can get back to enjoying a confident, functional, and complete smile. A gum-colored base. This supports the artificial teeth and is secured on a patient’s gums via natural suction or with the help of a mild denture adhesive. Artificial teeth. These are often constructed of acrylic or porcelain. Both materials closely resemble the look of natural teeth and can maintain their function and appearance for years. 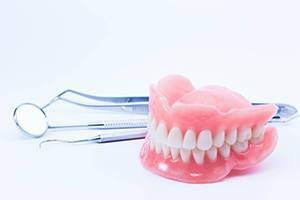 What Benefits Do Full Dentures Offer? 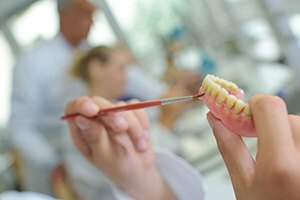 When they fit well, dentures can be quite We carefully design each prosthesis to accommodate a patient’s unique mouth. 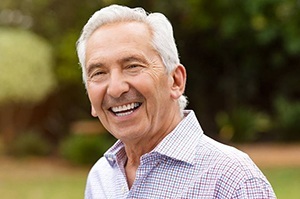 As long as you periodically get your denture relined (adjusted) and replace it when necessary, you should be able to avoid any major discomfort. Dentures allow you to eat a wide range of foods. You may have to tweak your eating habits a bit in order to avoid damaging your new teeth, but your dentures will still allow you to enjoy most of your favorite foods. Dentures are aesthetically pleasing. You can expect the color and shape of your new teeth to complement your face shape and work well with your existing oral structures. 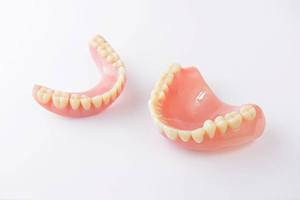 Dentures offer a reasonable degree of It may be 5 – 8 years before you need to replace them. If you would like your dentures to last even longer, ask us if you are a candidate for an implant-retained prosthesis. Compared to other tooth replacement options, dentures are relatively inexpensive. Insurance is often willing to help pay for them. What Is the Process for Getting Dentures? If you are interested in getting full dentures, contact your dentist in Abington to schedule a consultation. After we thoroughly examine your mouth and talk to you about your smile goals, we’ll recommend a tooth replacement solution that is a fit for your oral health and your circumstances. If we decide that full dentures will work for you, we’ll begin the denture process by taking some impressions and photos of your mouth. This data serves as the foundation for designing your denture. At later appointments, we’ll take further measurements of your mouth to help us determine the ideal length and shape of your new teeth. We’ll also use a wax model to test the fit and appearance of your prosthesis. When your final denture is ready, we’ll coach you on how you can care for it and adapt to daily life with your new smile. The entire process may take anywhere from a few weeks to a few months; we’ll discuss the timeline with you in detail during your consultation. We are eager to help you regain your lost smile! Contact us today to learn more about how full dentures may be able to benefit you.